Puppy obedience training establishes a positive beginning for your new canine companion. We build the foundation in puppy boot camp by addressing issues such as crate training, basic obedience, etiquette, and socialization. We also educate you, the owner, on how to manage puppy behavior, preventing or eliminating bad behaviors like mouthing, play biting, jumping, or nuisance barking. Our puppy boot camp creates an environment that values proper etiquette and reinforces inherent strengths. We take our puppy boot camp students on weekly field trips to public and private training sites where they participate in puppy obedience training, socialization, and obstacle courses. Training a puppy requires the skills, knowledge, and time to build the foundation of good behavior; however, the time and training established in the puppy stage will last a lifetime. Puppy Obedience Training (imprinting) - Practical and necessary commands for daily living. 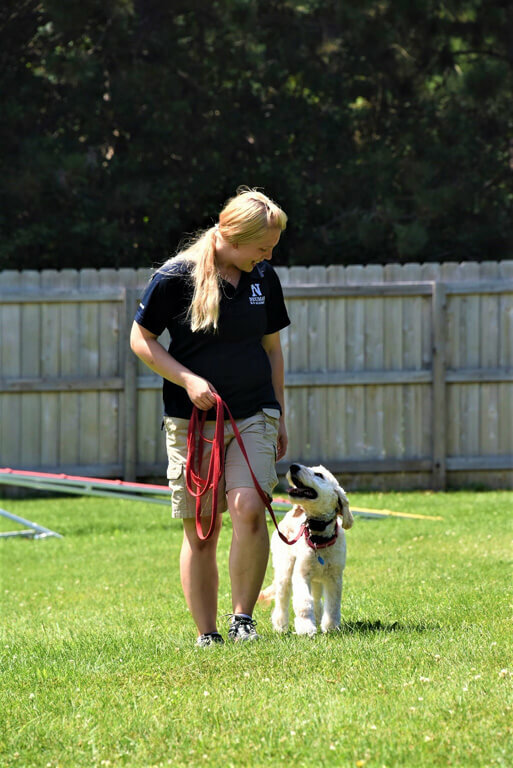 In this course your dog will learn to walk on a leash at your side without pulling, sit, down, come when called, wait at doors, go into a kennel on command, and more! Dog training commands for this program can be in German, Czech, French, or Dutch upon request. Socialization A puppy needs to be able to co-exist within the pack and have proper play style. Campers get to run and play in groups of dogs, learning how to act as a pack, and take direction from human pack leaders. Field Trips. Opportunities to practice obedience drills in a variety of circumstances. 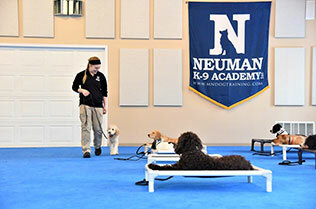 Dogs travel away from Neuman K-9 Academy to train in public and private training areas. In this course young dogs learn how to behave properly, meeting and greeting people or other dogs in public. Physical Conditioning. Puppy boot camp training means the pups are working hard, both mentally and physically. A tired, well exercised dog is happier and will absorb more in the training phase. We include daily cardio and strength training (low impact), unlike any other so-called dog boot camp. 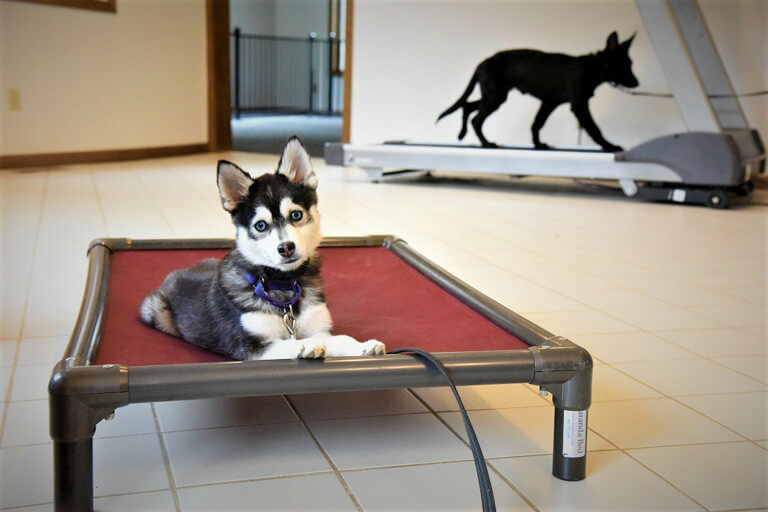 Treadmill Training for puppies. We introduce the treadmill at a young age so when your puppy grows up, you can use the treadmill for year around exercise. 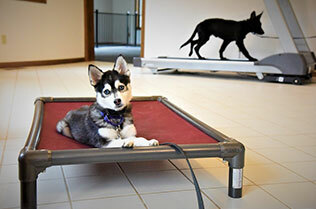 Treadmill training is part of the 8-week and 12-week puppy camps. Confidence Building. Obstacle courses, environmental stability, and dealing with adversity is why we call this boot camp. Dogs learn to work through various conditions that build confidence such as jumping in/out of vehicles, and going up/down stairs. Proper Etiquette. Meet and greet human companions without jumping up, and to wait at the door until given a command to enter. Behavior Modification. Custom-tailored drills designed to address problematic or unwanted behavior (nipping, biting, anxiety, barking, etc). We highly recommend the eight week camp for puppies that need behavior modification. 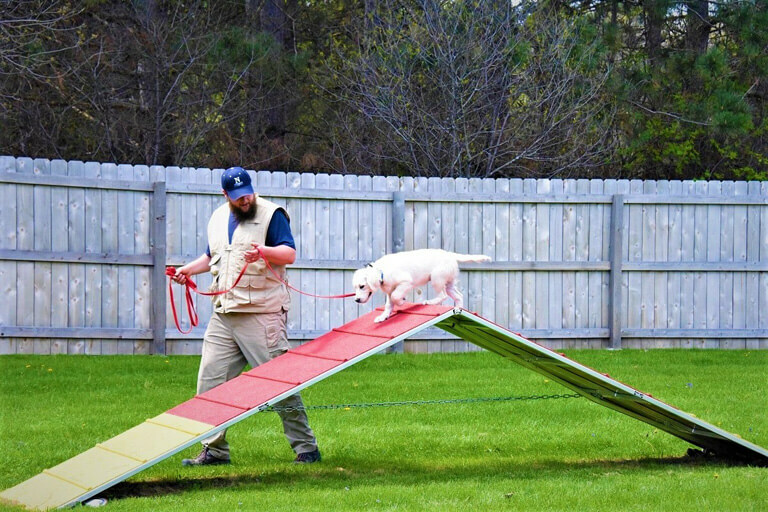 Upon completion of dog training boot camp, your canine will receive a certificate of completion in recognition from the Academy, written instructions specific to the course completed, and you will receive a Youtube video link of your dog performing the commands. 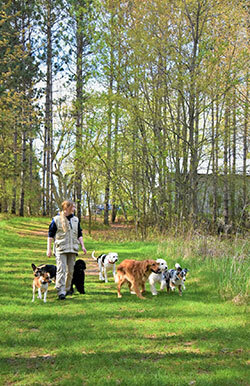 This is a basic obedience course with all commands trained on-leash. Level one will teach the basics of sit, down, stay, and walking on leash on your left without pulling. This course includes socialization, general manners, and basic on-leash obedience training. Curriculum includes: Basic on-leash obedience training, learning to walk on a leash without pulling, sit stay, down stay, going into the kennel on command, and socialization with other friendly dogs. *This course does NOT include distraction proofing, treadmill training, field trips, off-leash training, or public etiquette. ** No pre-requisites are required for this course. 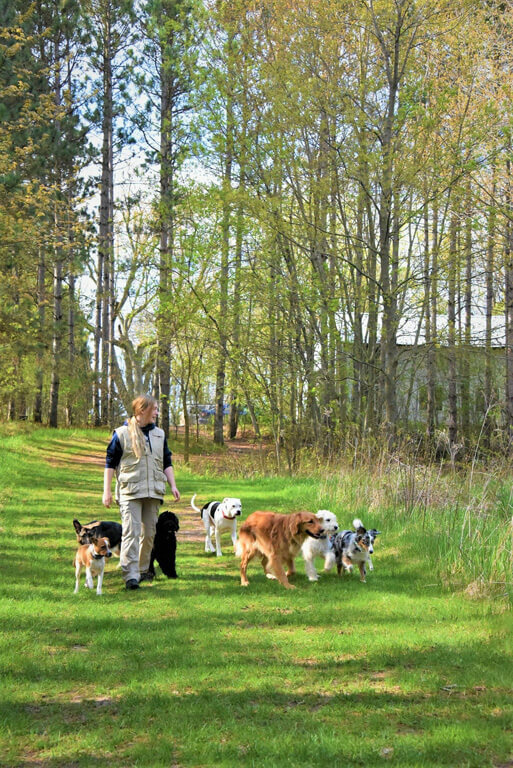 This course is designed for owners seeking a canine companion that can go into public places under control, respond to commands under distraction, and come when called (off leash) – even at the park. This course includes obedience training in public places, impulse control, distraction proofing, confidence building, and learning to get in/out of a vehicle on command. If you have plans to participate in the Canine Good Citizen program this camp is for you! * This program is ideal for puppies that need to be able to come when called off-leash, and have good manners at home as well as in public places. **No pre-requisites are required for this course. This course is the highest level of obedience training offered by the Academy. It is ideal for owners that want absolute control at home, in public, on-leash, off-leash, or in a high traffic environment. This program is recommended owners wanting the ultimate foundation and level of control both on and off-leash for their puppy. This course is the perfect course for owners that also will be doing therapy dog work when their puppy reaches maturity. Curriculum includes: Full spectrum foundation training, advanced obedience training (all commands listed in 4 and 8 weeks puppy boot camp), off-leash heeling, off-leash recall (come when called) with distractions, formal heel position, go to your bed (place), down from a distance, treadmill training & physical conditioning, field trips in high traffic places, walking past people and dogs under control, getting in or out of a vehicle on command (if puppy size and physical maturity are appropriate), waiting at doors, obstacle courses, socialization with other friendly dogs, confidence building, public etiquette, and more. * This program is ideal for all puppies 3+ months of age that need to respond to commands under high levels of distraction, to follow commands off-leash, or will be engaged in therapy work later on in life. Note: A $200/month fee will be applied to the puppy boot camp prices for giant breed puppies needing a colossal size crate. In order for ANY form of dog training to be successful, it is important for owners to understand how a dog learns from the training, how and when to use commands, and how to handle a dog lifelong in the real world. Handler training for the owner(s) is a day-long process where we teach how and when to use the commands, how a dog will continue to learn lifelong, and the owner's role of influencing and reinforcing their dog's behavior returning home. 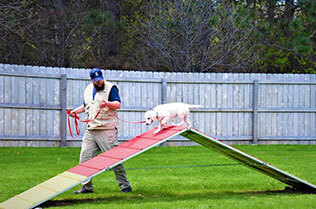 The success of our camp comes in two forms; training for the dogs AND training for the owners. Effective communication and proper motivation strengthens the bond between you and your dog. We provide clients with a well behaved, obedient canine companion that can walk on leash without pulling, respond to commands, and be a part of the family. Training a puppy requires the skills, knowledge, and time to build the foundation of good behavior, however the time and training established in the puppy stage will last a lifetime. Our facility is conveniently located in Hugo, Minnesota. We are 28 miles from downtown Minneapolis or 22 miles from St. Paul (Twin Cities, MN). We receive dogs from all over the country and can arrange shipping and receiving from the Minneapolis International Airport (MSP). The in-board training or board and train options we provide allow you to enroll your puppy for boot camp even if you are not close to our Academy. Neuman K-9 Academy is proud to be an active professional level member of the International Association of Canine Professionals since 2007. We are certain you will see a positive impact in your puppy returning home. 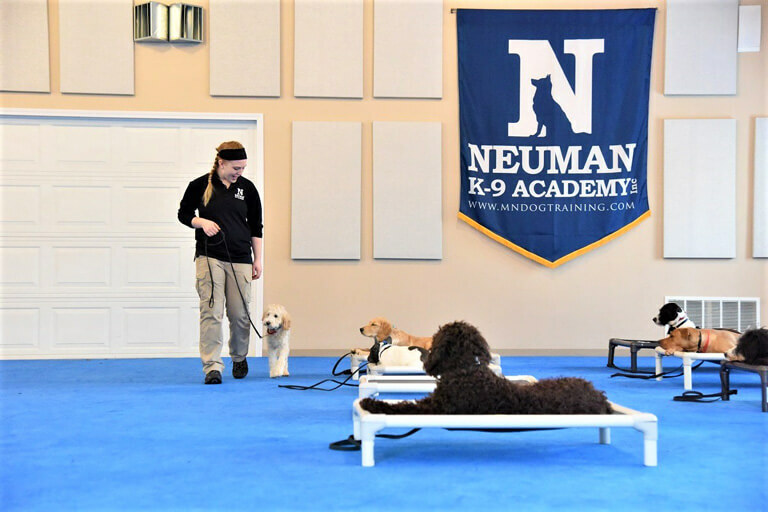 Don't take our word for it - See what clients are saying about Neuman K-9 Academy! Click here to learn 10 Key Benefits of Our Puppy Boot Camp.